Heat oven to 375°F. Spray 9- or 10-inch glass deep dish pie plate with cooking spray. In 12-inch nonstick skillet, melt butter over medium-high heat. Add potato, onion, thyme, salt and pepper; cook and stir 10 to 12 minutes until potatoes are lightly browned. Sprinkle flour over potato mixture. Cook and stir 1 minute. Stir in broth; heat to boiling. Reduce heat; cover and simmer about 8 minutes, stirring occasionally, until potatoes are almost tender. Remove from heat. Stir in thawed vegetables, milk and cheese. Spoon mixture into pie plate. Separate dough into 8 triangles. Starting at short side of each triangle, roll up triangle halfway. Carefully arrange over vegetable mixture with tips toward center; do not overlap. Place pie plate on cookie sheet with sides. Quickly and easily thaw the frozen vegetables by placing in a colander and running under warm water. 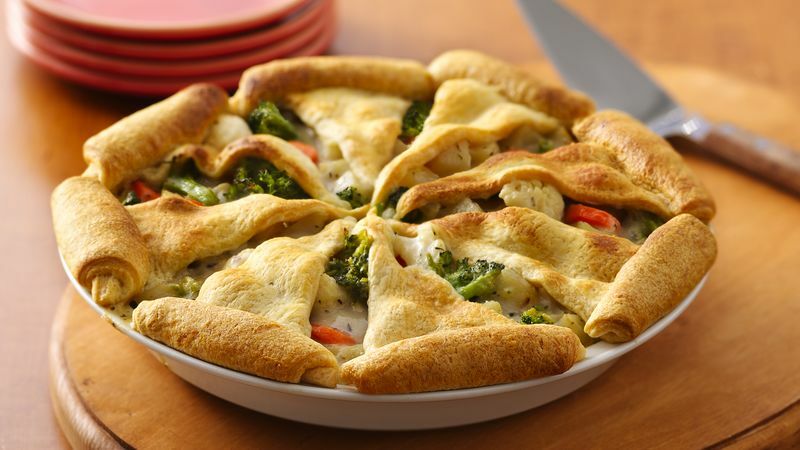 This pot pie is very versatile. Serve it as a meatless main dish or side dish!